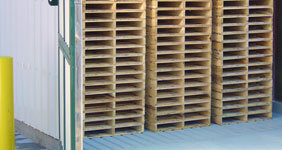 Woodway, Inc. offers heat treatment for all your shipping support products. We can help you meet the requirements designed by the IPPC (International Plant Protection Convention) to create better quality assurance. ISPM 15 (International Standards for Phytosanitary Measures) was developed by the IPPC in order to directly address the need to treat wood materials of a thickness greater than 6mm in shipping products between countries. All solid wood materials must sustain a temperature of 56C or 133F reaching the core of the material for a minimum of 30 minutes. Our standard heat treatment schedules exceed both of these requirements. Pallets, crates, dunnage and wood packaging material are required to carry the certification stamp on two sides of the product. The stamp is trademarked by both the individual inspection agencies and the IPPC. These agencies will protect their trademark and copyright by allowing only those companies who meet and maintain their standards to use this stamp. Implementation of this program is maintained by the agricultural department in each country. Facilities certified for heat treatment are subject to unannounced monthly inspections. Records and documentation must be available at all times, thus insuring compliance to regulations for any heat treated product. It not only meets the international requirements which prevent insects and nematodes from being transported across national borders, but it is environment-friendly and meets the needs of the ever-growing list of environmentally conscious companies, who are now refusing Methyl Bromide (a poisonous gas) treated products. Heat treatment is also well-suited for the domestic food industry to ensure insect-free and chemical-free products. Woodway, Inc. is dedicated to providing the best possible services to their customers in order to protect the quality of their product.